I can't imagine that any company that provides panic room construction talks about it to anybody except their clients. Also can't imagine that anyone in George's circle would talk about it. Amal's...? No idea. It's kind of a bragging thing in some circles. And I get Lizzy's point. Amal didn't have a panic room in the flat or at her mom's, so what's different is George. He may be wary of the increasing brazenness of the crazies across Europe. Or maybe she asked for it. Or maybe it increases the value of the house for the divorce settlement. Just kidding on that last thing. Don't jump all over me. Perhaps the panic room could be for extra security for Amal when she is in England for work and George is working elsewhere. Though it would be unlikely that she had a panic room at her flat she is now more high profile because she is George's wife and her work is getting more publicity and there may be some concern for her safety. Also as W2O4D says there are a lot of crazies these days. On the other hand it could be a place for them to go for sanctuary when Baria visits and nags them about having babies! Ha! Funny you should say that, Way2. I read an article the other day (and it referred to the Clooneys - helps readership of course) which basically said that if you're a Uk resident and you own several houses, you usually have to declare the most expensive one for capital gains tax purposes. Think I've got that right - correct me someone if I'm wrong. It's probably almost irrelevant to them, but maybe the British house is the most valuable one - and getting more so by the day. If they're putting in a panic room, I wonder if that means that George has retired his bat for protection? If they're afraid for her safety, does that mean they'll put panic rooms in all their houses (there are at least 4 that I can think of) or are they only worried about her when she's in the UK? If she's really at risk, it doesn't make sense that she'd only be in danger there. Well, first of all, we don't know if the story's true - the very phrase 'panic room' is emotive, but a great headline! If I remember correctly, the original renovations story talked about a biometric security system. No idea what that consists of, but the original details on the house sale included cameras etc, so maybe they're all just being updated. But I can't imagine the other houses DON'T have excellent security systems anyway....and for both of them now, given who they have married, and more importantly the present nature of the world, the risks are heightened I guess. Or that's probably what the security advisors would say. If the story were true I would imagine George would be really pissed with whoever leaked it. I do think George would be extra protective of Amal's safety - as PAN said with the present nature of the world the risks are heightened. Even though Amal worked on high profile and even controversial cases before she knew George her image has risen significantly since her relationship and now marriage to him. Two things have changed since her marriage, hence the increased need for a panic room I assume: firstly, it's much easier for people to track her down now she's married to George. Who knew where she lived before? Secondly, she's now much, much, MUCH more high profile and therefore a more interesting target. Before she married him, how many people outside of her profession had heard of her? In those days if anything happened to her, it would only warrant a few paragraphs in the broadsheets, but now as the wife of one of the most famous film stars in the world . . .
On another note, did anyone see the article in the Sunday Times saying that the team behind the Soho House group are thought to be doing the remodeling of their home? Moving on: Will the Clooneys join the club? It is the decorating gig of the decade: who will be selected to do up George and Amal Clooney’s new home in Oxfordshire? Renovation work has already begun on the A-list couple’s nine-bedroom home, and word on the street is that the team behind the Soho House chain — the hip private members’ club, hotel, spa and restaurant empire — have been approached to revamp the interiors. So... George likes "nice" things, but cares so little for the logistics of high-end decorating that he picks his own "comfortable" furnishings for his LA home and allowed his best friend to design the interior of his multimillion-dollar Cabo vacation villa. But now he's going to go out and hire a professional and well-known interior design team for the London estate? WTF? George has a wife so I'm guessing she is in charge of the decorating. George was single with the other houses and probably could have cared less, the only reason the Los Angeles home was decorated was because Rande told George it looked like a frat house. Oh, I think he knows women very well and is to some extent doing what every wise husband knows is by far the best approach to internal decor and say 'Yes. dear'. But remember he's spent extensive time in Soho House Berlin and probably likes it too. Don't blame him!! Absolutely PAN and annemarie. And I would think Amal has her own distinctive ideas on how she would like their home to look. Probably she would like their Sonning home to reflect her style more than obviously the LA, Cabo and Como homes do. But I would think as time passes those homes will change over too. But that's to be expected and I'm sure George will be just fine with that. I think he's a very agreeable guy and easy as hell to please. I wonder if Geoffrey Robertson has a panic room? If he has, and he is certainly someone who warrants one, I very much doubt he or anyone close to him would talk to some crappy tabloid about it. Okay, this is not as bad as it sounds. The National Rivers Agency say the fence is too near the river i e it will rot, or the cement that may or may not be holding it in may not do the river wildlife any good. George and Amal Clooney have had to re-think their plans to secure their privacy at their Grade II-listed manor house in Berkshire after allegedly being told to remove a fence. 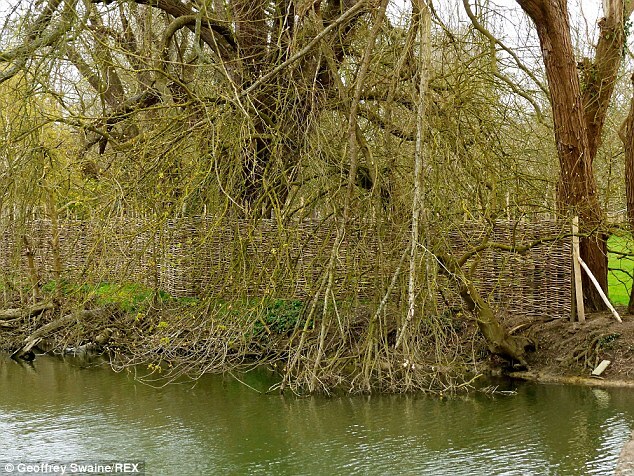 Builders working on the Clooneys' home in Sonning on Thames is said to have been told to remove a lattice fence as it is not the required eight feet from the riverbank. 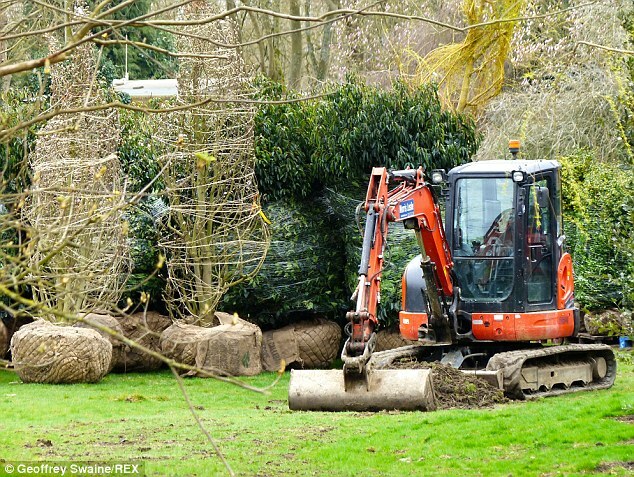 Last week, the couple's plans for their nine-bedroom £10million mansion, which they bought last year, were revealed. Hollywood star George, 53, and human rights lawyer Amal, 37, are believed to be making the Berkshire home their UK base, but not before making some changes to the property and the grounds. Plans submitted to their local council reveal alterations to the mansion's existing boat house, replacement of entrance gates and piers, erection of outbuilding for services, new boundary fencing and a replacement garden room. Their planning application says the 'Grade II Listed Building has been a home since its construction in the late seventeenth or eighteenth century. 'The proposals will assist in its continued use as a home, the use for which it was originally designed. 'Both the character and the appearance of the resulting home will be positively enhanced as a result of the proposals. 'The detailed design and access of the proposals have been carefully considered with the sensitivities of the site foremost in mind, including the heritage, flooding, biodiversity and arboriculture interests of the site'. Although the Clooneys were reportedly told to remove the lattice fence, the couple have already submitted plans for a new perimeter fence. 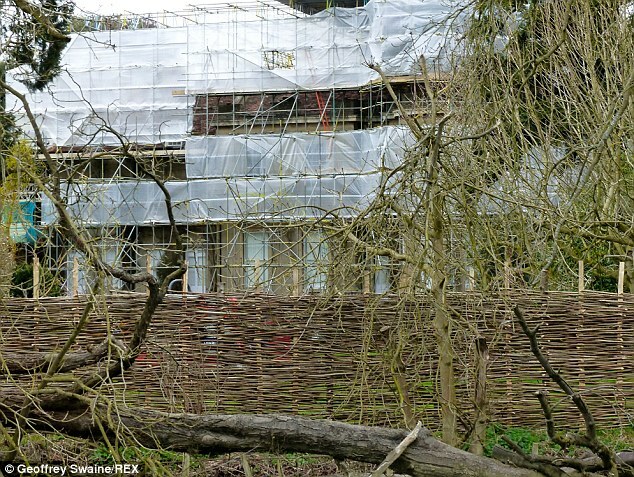 Plans show a mix of woven hazel and riven Chestnut pale fencing will be put up around the country estate, as well as extensive planting of oak, yew, holly and box edge to enhance the couple's privacy. The Clooneys have now been told to remove the current lattice fence, and builders could be seen working on replacing it with trees. Wouldn't you think the local contractors would know the zoning regulations about where they should place the fence? I wonder if they'll charge extra to move the fence back from the river? A little creative bill-padding going on? Well, presumably they're doing what they've been asked by their clients - or maybe just testing what they can get away with. A surveyor would know perfectly well what the rules are, but if rumours are true it's not necessarily a little local lot involved, but possibly Soho House. She's probably got the reigns on this one, she's the wife and the property deed no doubt has her name on it. All well and good. For Georgie.. it's an investment/tax shelter, as are all his properties. As far as the actual choices for interior... given the amt of time he'll actually be there, he probably could care less what she picks out, unless it's Barney the dinosaur purple ( her fav color) all over the house. GEORGE CLOONEY is seeking planning permission to install a CCTV system at his £10million home in Sonning Eye. 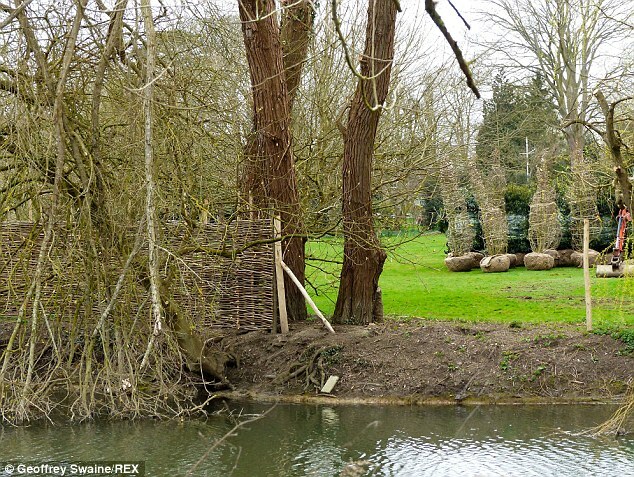 The actor and his wife, Amal Alamuddin, want to put up eight cameras on wooden poles in the grounds of Mill House and attach a further 10 to the Grade II listed property. Six of the poles would be four metres high, another would be five metres high and the eighth would measure six metres. Each camera would be housed in a protective vandal-resistant dome and could be tilted or panned to face in any direction. Eye and Dunsden Parish Council objects, saying the “wide range” of the cameras “represents a potential infringement of the privacy of neighbouring properties”. However, South Oxfordshire District Council’s conservation officer recommends approval as long as the cameras can easily be removed from the building. The district council will make the final decision. Two months ago it approved the couple’s plans for a new swimming pool, pool house, home cinema and annexe, a replacement river house and new boundary fencing. It asked Clooney to reduce the size of the river house, which he agreed to do. The parish council also objected to these because it wanted the fencing set further back from the river. Clooney and Alamuddin, a London-based human rights lawyer, bought the property in October last year. Oh my. I hope George 's new neighbors are going to be friendly and welcoming. Sounds like there's a lot of bickering over all the changes, noise and potential intrusion of privacy. Obviously the neighborhood doesn't appreciate their new neighbor too much. They have no idea what a great guy he is and that he will surely bend over backwards to soothe ruffled feathers once he moves in. Donnamarie - It sounds like it's the actual construction work that's bothering a lot of people. I think once they're finished and all the noise and mess are gone they'll find things aren't much different than they were before and everyone will calm down. I hope George's neighbors aren't the kind of people who complain about anything new whether it affects them or not. Agree Lizzy. Neighborhoods tend to get cranky and snippy when there is construction going on near them. Everyone's noses get out of joint. I'm sure the community that George has moved to is very quiet and serene. People who live there want to keep it that way. They don't like the change so they are complaining. Hopefully all will return to calm afterwards. They should be very nice to their new neighbor! Donnamarie wrote: Oh my. I hope George 's new neighbors are going to be friendly and welcoming. Sounds like there's a lot of bickering over all the changes, noise and potential intrusion of privacy. Obviously the neighborhood doesn't appreciate their new neighbor too much. They have no idea what a great guy he is and that he will surely bend over backwards to soothe ruffled feathers once he moves in. They onlu have MIL to deal with.Not George no great guy yet just MIL.Maybe why disappointed. His mother in law doesn't live there they are dealing with George and Amal It is their home and they have the say so. From the air it looks really open I hope George will cover it more with trees otherwise those helicopters will fly more often over his home as the view is perfect. Wonder if paps are allowed to fly over properties whenever they want??? Looks like there is still much work left to do. Pretty extensive renovation. I'm sure there is a lot of noise on a daily basis. It can be unsettling for neighbors who live near construction. Lots of us have endured the racket. But it's temporary and I'm sure the property will be beautiful when it's completed. Maybe G will invite the neighbors over for drinks after they move in. Drinks and sympathy. From earlier photos I had the impression that the house was fairly secluded, but this photo makes it look really exposed. Is that parking lot (car park for my Brit friends) at the top of the photo actually part of their property? Is the road at the bottom of the photo a public road? This property seems even less private and more accessible to photographers than the villa on Lake Como. The car park is on the other side of the river behind the house. I think it is pretty private there are tons of trees surrounding it . Who the hell needs this much property????? IMHO, our nice guy from Kentucky has certainly changed since his ER days. Ok, so he likes and obviously can afford the finer things in life, but ( again, IMHO) this is becoming pretentious, grandiose, overblown and pompous. Gee, PigPen.. tell us how you really feel!! Yeah yeah yeah- his money.. he can spend it as he wants. But really folks....the engagement, the wedding now this...who stole our Georgie and where are they hiding him? 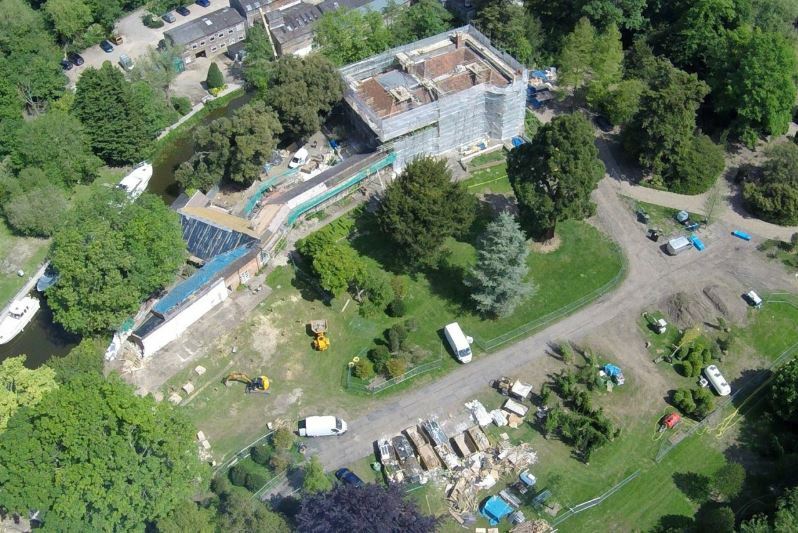 I don't know how recent this aerial pic is but if it is recent there is still lots of work to be done. A September move in might be optimistic. Maybe this is an older pic. LizzyNY wrote: From earlier photos I had the impression that the house was fairly secluded, but this photo makes it look really exposed. Is that parking lot (car park for my Brit friends) at the top of the photo actually part of their property? Is the road at the bottom of the photo a public road? Yeah, but he knew this before he signed on the dotted line. Or, maybe that's what he wants.......who knows what's going on in that mind of his. To say he's changed would be an understatement..
You cannot see anything at all from the road, the Mill at Sonning,(which has a boatyard beyond the car park) or anywhere else. The whole place is covered with trees, and that includes the island itself with its other residential houses..
All George's homes are big, this one needs work so they are doing it. George has spent money on all his homes nothing new here. Once it is finished they won't have to do anything to the property for years just maintain it. The home should be what they want so they can enjoy it. The only thing is that with this house everything has to be made public record so we are given details, I'm sure if possible none of this would have been public and kept private. You forgot louie he needs room too. Donnamarie wrote: I don't know how recent this aerial pic is but if it is recent there is still lots of work to be done. A September move in might be optimistic. Maybe this is an older pic. Didn't we read somewhere that they moved the date back to December '15? George's homes are also investments , I remember him saying that in some interview. I thought that was the US Weekly article that claimed a December move in date .... with a nursery. LOL! But since I question that whole article I was using the timeframe that George has been stating. Isn't there a charity event that George Amal Rande and Cindy are hosting coming up. Or was it just George and Amal? I was thinking they might use the estate for that . Yep. He said they were hoping for autumn, and how it's weird to be an hotel when you really want to be in your home - and I would guess their aim is Christmas. In a way you could think about this as a British version of Como - except it's a lot smaller (unless of course he's bought the odd extra house in Sonning too. It is a beautiful and historical place in a beautiful area, and I think we're lucky that he's so delighted with his new life that he wants to share stuff about it although a lot of it has to be in the public domain with planning etc. He has a boathouse there too. In a way, the Cabo sale looks the most likely - he never seemed to have the same degree of freedom there - not a lot of water excursions, tho lots and lots of sun. Great architect too. Wouldn't mind betting some of the profits go to SSP and the Sentry. Pan I think the Mexico house was way too open beautiful but not enough privacy from the paps. I can remember George on the beach once or twice . I think the Sonning house will be his new residence replacing his LA home. He certainly will continue to use that house but Sonning is " their home". For a long long time. So the extent of the property and the expansive renovations make since. Cabo is a great get away when he was in LA. BUT he probably doesn't think it's a practical retreat anymore. Won't get used as much and the upkeep is money not wisely spent. I don't think it will replace his LA home he has said he hates the cold that's why he lives there. They will probably split their time between both places. All his friends are there and a lot of his work . MY guess winter LA, summer Como and fall England. Also there when Amal has to be there. Well I guess we will see over time. There are many changes in George's life that none of us foresaw. True , but I think they are wonderful changes he is so happy and that is a good thing.